There are two major priorities to compete and thrive in today’s market: build speed of flow (flow of production, capital, information, delivery etc.) and adopt a customer-centric approach. The greatest impediment to achieving both is the existence of silos. These artificial barriers create undesirable effects that result in what we might call “silo sickness”. When organizations are created and organized in a matrix of vertical hierarchy and functions, an inevitable consequence is the existence of a series of “walls” or divisions. These barriers inhibit the resources involved in producing an optimal result toward the overall goal. Communication gets slowed down or completely blocked, innovation struggles to emerge through the ranks and bureaucratic practices, projects are delayed and go over budget, quality suffers, and reaction time to changing market demands is too slow. At the organizational level, departments carry out their work based on the local measurements and therefore focus on local optima, losing sight of the overall goal of the organization. Production planning, for instance, in the steel industry can be completely uncorrelated with sales. This is because there is no feedback mechanism within the organization (and poor interdependence with customers and suppliers). Even more dramatically, silo sickness means that the larger implications of cause and effect relationships that exist in organizations are totally disguised. It takes time for the effects of a cause to propagate through a system. People have no means of understanding the implications of their local, siloed decisions for the big picture. Even the heads of functions are blind-sided to those implications. For example, let’s say that the VP of Operations decides to cut 5% of maintenance costs. A moment will come when the organization is unable to make a sale because it is unable to deliver what it has promised due to breakdowns, and nobody will ever know that the problem originated in the cutting of maintenance costs. So why do silos exist? Why do people work in silos in the first place? Surely people are trying to do their best, so why do they work in a way that sub-optimizes everything? What is the root cause? 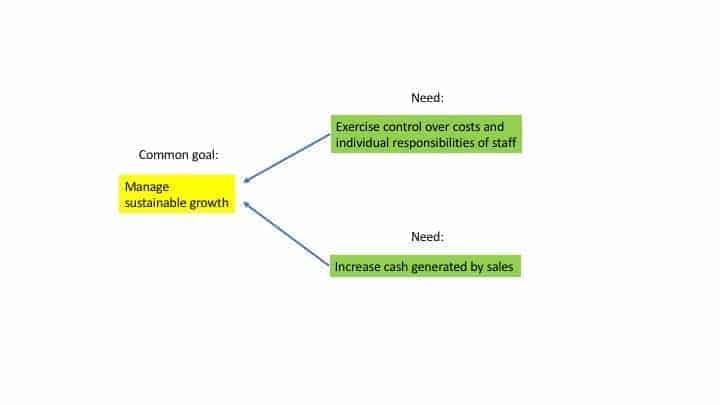 To understand that we must look at the two major needs that an organization tries to protect: On the one hand, exercise control over costs and the individual responsibilities of staff and on the other hand, increase cash generated from sales. Fig. 1: Visualization of two major needs an organization tries to protect. Both needs have the common goal of “Manage sustainable growth”. However, there are a set of assumptions (mental models) that make people think that a traditional hierarchical/functional organization is a better way to control things. The hierarchical/functional organization reflects a mechanistic, Newtonian worldview, where separation is feasible and dynamics are linear. This attitude lacks awareness and understanding of our new reality that is dominated by increasing complexity, meaning unprecedented levels of interdependencies. The global optimum is equal to the sum of the local optima. To challenge these assumptions operationally we need a plan of action that can transform an organization into a whole system. The question then becomes, if a traditional hierarchical/functional organization creates silos when what we need, instead, is to work as a whole system, how can we best manage the interdependencies? If we don’t have functions and traditional hierarchy, then, you may be wondering, where is that command coming from and how do we “control” this kind of an organization? The good news is that we don’t have to reinvent the wheel. The model for organizations to follow has been around for decades. Dr. W. Edwards Deming, the founding father of Quality, looked at the big picture of how elements of a system interdepend, as we mentioned in our previous article ‘Building Organizations Fit for the Digital Age’. Deming has shown us that it is of fundamental importance to recognize that an organization is a system, i.e. a network of interdependencies that work together to achieve a shared goal. After Deming, another management giant who was also a physicist, Eliyahu Goldratt, introduced the concept of accelerating flow through a strategically chosen leverage point, or “constraint”. Taken together, the contributions of Deming and Goldratt provide us with a meaningful and effective way to overcome silos, well beyond various techniques that may be appropriate for software teams but not for shifting entire organizations. We are talking about nothing less than transformation (to quote Deming). Transformation of the prevailing management style based on hierarchy and artificially created silos towards one of system optimization. With this article, Domenico Lepore continues his mini-series of articles that focuses on how to build companies that are fit for the digital age. The next one will be about ten steps for transformation. Dr. Domenico Lepore is Founder of Intelligent Management Inc. With a background in physics, he is an international expert and innovator in leveraging systems theories and complexity science to radically improve business performance. He has led international implementations with his Decalogue™ methodology at over 30 national and multinational organizations in a variety of industries including IT. His latest international publication is ‘Quality, Involvement, Flow: The Systemic Organization’ from CRC Press, New York.